BJP President Amit Shah, during his rally at Malda in West Bengal, claimed that no one raised ‘Bharat Mata ki Jai’ and ‘Vande Mataram’ slogans at the United India Rally held on January 19 at Kolkata. 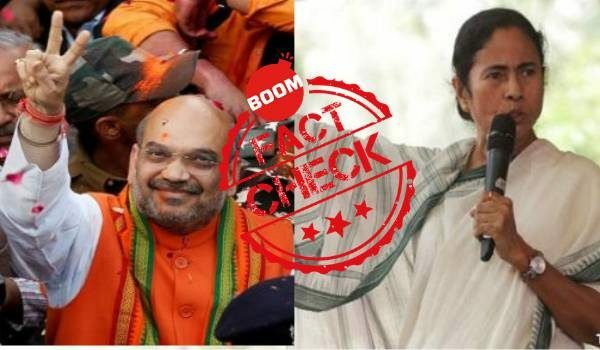 Shah made these claims to take a dig at the opposition leaders coming together at Kolkata to stitch an alliance against BJP in the upcoming general elections. You can hear Shah allege that none of the patriotic slogans were raised in the live video of his Malda speech that was uploaded by BJP’s Twitter handle, at the 13:50 mark. However, we did find a couple of instances where the patriotic slogans, mentioned by Shah, were raised. Patidar leader Hardik Patel, as he ended his speech at the rally, chanted ‘Jai Hind’ and ‘Bharat Mata ki Jai’. You can see him raising these slogans in the video of his speech below at the 02:45 mark. Mamata Banerjee also ended her speech with chants of ‘Vande Mataram’ and ‘Jai Hind’. In the video of her speech below, you can hear her raise these slogans at the 25:23 mark. your rss feed as I can not find your email subscription hyperlink or newsletter service.